The Obama administration’s recent decision to suspend deportations and grant renewable residence permits to young ‘illegal’ migrants brought up in the United States will benefit up to 800,000 young people. Meanwhile, the UK government offers no solution for its 120,000 irregular migrant children. For over ten years, the US Congress has been pondering whether or not to pass a bill called the DREAM Act (Development, Relief, and Education for Alien Minors) to regularise the position of young undocumented migrants who were brought to the US at an early age. Given the situation of political standstill, the Obama’s administration, which had championed the bill in the previous electoral campaign, has eventually decided to intervene through an executive action by granting a suspension of deportation proceedings against young undocumented migrants. With immediate effect, the order stops the deportation of irregular immigrants under 30 years old who arrived in the US before their 16th birthdays. However, to benefit from the protection and be eligible for a two-year work permit (renewable indefinitely), the applicant must have lived in the US continuously for five years, have no criminal record or have graduated from high school or served in the military. On this side of the Atlantic this population is mostly below the radar of current political debate. Little is known about the UK’s undocumented migrants, and even less about the children who live in Britain without legal immigration status. 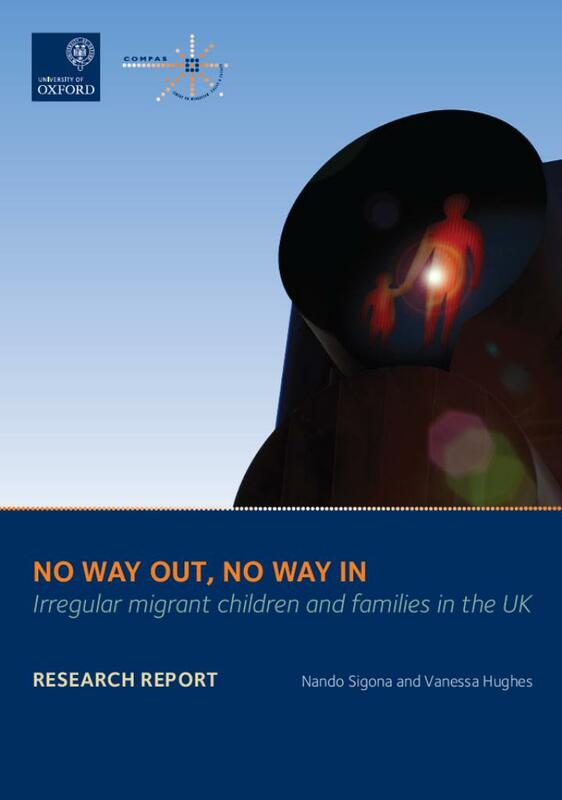 A recent study entitled ‘No way out, no way in: Irregular migrant children and families in the UK’ conducted by researchers at the University of Oxford’s Centre on Migration, Policy and Society (COMPAS), and funded by the Barrow Cadbury Trust, set out to shed light on the lives and livelihoods of these children and their families and examine the extent to which the UK government complies with its commitment to the best interests of every child living in the UK, formally enshrined in the UN Convention on the Rights of the Child (CRC 1989). Both international and British laws guarantee children access to education and healthcare, irrespective of their immigration status, and oblige public authorities to work in the children’s best interests. But our study suggests that increased demands on public authorities by the UK Border Agency, such as asking social services to report suspected irregular migrants, are pushing families and children away from essential services, leaving them more vulnerable and isolated. This can also mean that children and their families who are victims of serious crime may be afraid to report it to police because of their fears about their immigration status. Frontline professionals like GPs and teachers are increasingly being asked to check the legal status of children in their care. Not having legal status can mean the children either don’t go to school or can’t participate fully. It also means they may not be able to register with a GP or that pregnant mothers who lack legal status may avoid antenatal and postnatal care because of for fear of being reported to UKBA. Support organisations that have played an important role as facilitators of access to public services and as providers of emergency assistance for irregular migrant children and families are now struggling due to lack of public funding. This is leading to cuts in services that inevitably will affect the most vulnerable migrants. One of the main findings of the study concerns the size and demographic profile of this population. The study estimates that there are 120,000 undocumented migrant children in the UK, which corresponds to 0.9 per cent of the overall UK’s population under 18. The large majority of them are either born (65,000) or have spent most of their childhood in the UK. These children were brought up in the UK, educated in British schools and many speak English as their main language. The only home they know is the UK. While current policy and public debates focus mainly on separated and unaccompanied children in their late teens, the study estimates that most irregular migrant children are under 12 and live with their parents or close relatives. These findings can potentially have significant policy implications, as they invite a refocus of public understanding of this population. More attention should be paid to the impact of current policy and practice on the early years of irregular migrant children in the UK, starting even before birth with antenatal care. Two areas should be afforded particular consideration: the impact of NHS charging policy for overseas visitors on mothers and babies without legal immigration status, and how existing levels of support are affecting children’s overall development in the foundation years. Moreover, in assessing the best interests of the child and the impact of irregular status on children one cannot isolate the children from their families and circumstances. The promotion of secure, strong and stable families, in line with the government’s own policies, should therefore be at the centre of policies aimed at promoting the best interests of migrant children. Overall, the UK government privileges a piecemeal approach that leaves out the big picture. It provides quick and temporary fixes for some, leaving the majority of irregular migrant children out. Even in their best incarnation, and the COMPAS study shows a great deal of local variations in terms of delivering of public services, UK authorities (both national and local) tend to focus on providing essential welfare to vulnerable children on human rights grounds but rarely see and address the reality of 120,000 young people who grew up in the UK and, as a result of current and previous policies, are de facto non-deportable while permanently excluded from citizenship. Meanwhile, the political momentum behind the campaign for an earned amnesty for undocumented migrants championed by a coalition of NGOs, Churches, local authorities and with the support (recently withdrawn) of the Mayor of London, languishes. What does it take for a UK’s DREAMers movement to emerge? “No Way Out, No Way In: Irregular migrant children and families in the UK”, by Dr. Nando Sigona and Vanessa Hughes, published by COMPAS, is being launched at the House of Lords on Monday, 25 June 2012.